TLC can officially change the show's name, again, to '19 and Counting' because Michelle and Jim Bob Duggar welcomed yet another baby girl, their 19th child, into their family. Their new daughter, Josie Brooklyn, was born prematurely during an emergency c-section, but is resting in stable condition in the NICU. She weighed 1 lb. 6oz. 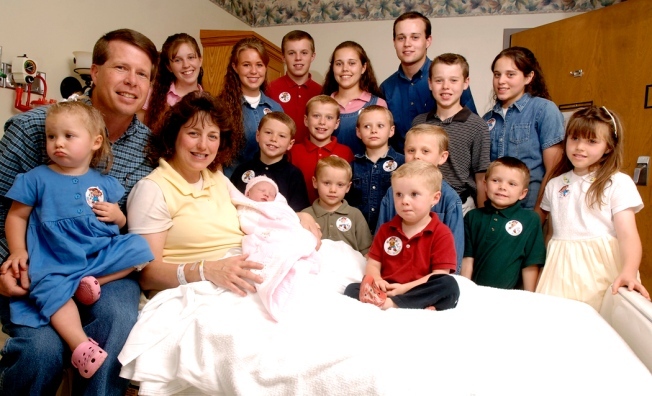 Surrounded by 18 children and one grandchild, Michelle Duggar dandled her newest baby on her knee and said she would risk another premature birth to add a 20th child to the brood she shares with husband Jim Bob. “When we look at Josie — we were just talking about it this morning — and I thought, even knowing that we went through the challenge that we did, we would do it again,” the supermom told TODAY’s Meredith Vieira Tuesday from the family home in Springdale, Ark. Michelle Duggar experienced gall-bladder problems and a dangerous case of preeclampsia while pregnant with Josie. To save Michelle’s life, doctors in one of Arkansas’ premier hospitals delivered Josie 3½ months prematurely in early December. The infant weighed 1 pound, 6 ounces. Her head was the size of a cue ball. Michelle rapidly recovered, but Josie endured a series of medical emergencies, including a perforated bowel. She was finally sent home from Arkansas Children’s Hospital in April, but was rushed back with digestive problems that turned out to be lactose intolerance. Josie was released again in June, more than seven months after her birth — and, the Duggars said Tuesday, has been thriving ever since. The Duggars are conservative Christians who believe in having as many children as possible. The older girls take care of the smaller children, and all are home-schooled in their 7,000-square-foot home. The family stars in the TLC reality show “19 Kids and Counting,” which kicks off its fifth season Tuesday night. Jim Bob Duggar agreed that Josie is doing very well. “They say by the time she’s 2 years old, she should catch up with someone developmentally who’s 2 years old. It’s amazing how well she’s doing. We’re just so thankful to God that she is thriving and doing well,” he told Vieira. The infant still breathes supplemental oxygen when she’s sleeping, but the family said doctors say she’s developing normally. Michelle confirmed that her health is back to normal. “I definitely feel much better than I did seven and a half months ago with preeclampsia. My blood pressure is great now, and I feel good. I’m really thankful; just so grateful to have Josie,” she said. While Josie was in the hospital, the family moved to Little Rock to be closer to her. The two oldest sons stayed at home to take care of the family’s real estate and used-car businesses. The family expressed delight at being back in their home. The oldest Duggar, Josh, is 22 and married to Anna, whose first child, Mackynzie, is two months older than Josie. Twins Jana and John-David, 20, recently returned from a church mission to Asia, the first time they had been so far away from home. All the Duggar children have names beginning with the letter J. They are Josh, 22; twins Jana and John-David, 20; Jill, 18; Jessa, 17; Jinger, 16; Joseph, 15; Josiah, 13; Joy-Anna, 12; twins Jedidiah and Jeremiah, 11; Jason, 9; James, 8; Justin, 7; Jackson, 5; Johannah, 4; Jennifer, 2; Jordyn-Grace, 1; and Josie Brooklyn, 8 months. Michelle, who likes to say that having too many children would be like having too many flowers, repeatedly expressed her gratitude at having Josie home and healthy. “We have this precious gift, and it’s a miracle,” she said.